Whenever I get sick - and I have unfortunately caught quite a few more bugs than usual since my son started daycare - I like to turn to natural remedies first. I am not anti-medicine by any means but I make a point to be careful about what I put in my body and unless it is prescribed by a doctor for something serious, I often feel like simple cold should just be waited out. This is not to say you shouldn't seek relief from the symptoms. This is where natural remedies come in. Here are the few things that help me feel better when I have a head or chest cold. ✥ lemon + honey: a classic I always go back too, especially to relieve a sore throat. I mix a lump of honey and the juice of a lemon in a cup of boiling water and sip as I would hot tea. It's soothing, hydrating and delicious. ✥ saline spray: not the most pleasant but still the best remedy I have found for sinus congestion. 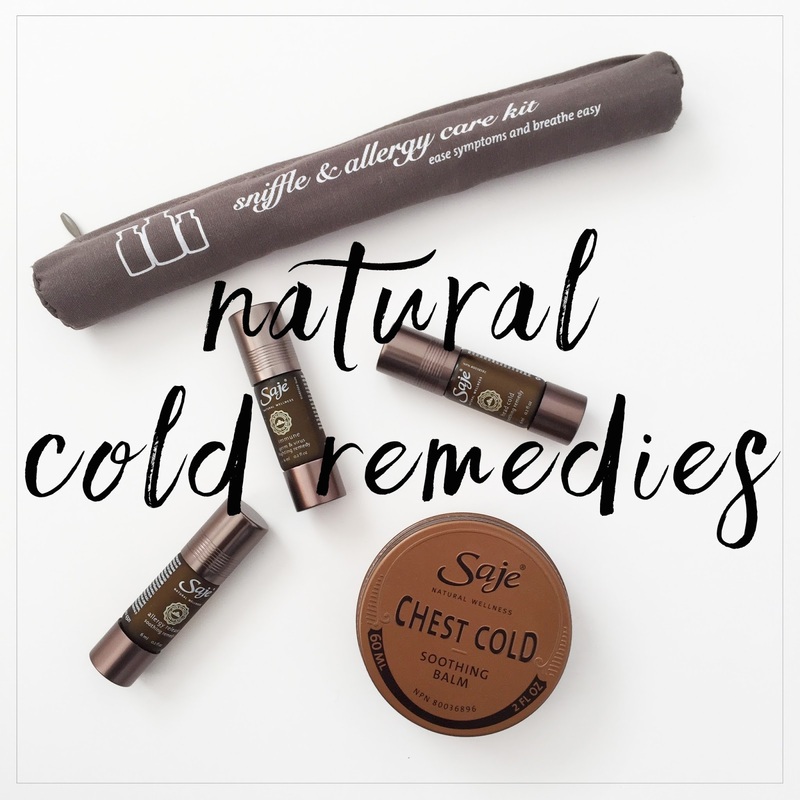 ✥ essential oils blends: I absolutely love the Head Cold, Immune and Allergy Release roll-ons from the Saje Wellness Sniffle & Allergy Care Kit. It's so easy to use and you can feel it working as soon as you apply it. ✥ balms: Chinese tiger balm helps with headache and congestion but can be a little strong and overpowering. I like the Chest Cold Soothing Balm by Saje Wellness. It is strong enough to be efficient but not overpowering (I absolutely hate Vicks! ), it is easy to apply and is not too thick or sticky. What are your go-to remedies when you have a cold? Please note that I am not a doctor. If you are sick, consult your doctor or your pharmacist. These are temporary ways to relieve common cold symptoms, not cures, and you should consult your doctor for any health concern.